The 100, 200 and 300 amu residual gas analyzers from SRS offer exceptional performance and value. These RGA's provide detailed gas analysis of vacuum systems at about half the price of competitive models. Each RGA system comes complete with a quadrupole probe, electronics control unit (ECU), and a real-time Windows software package that is used for data acquisition and analysis, as well as probe control. 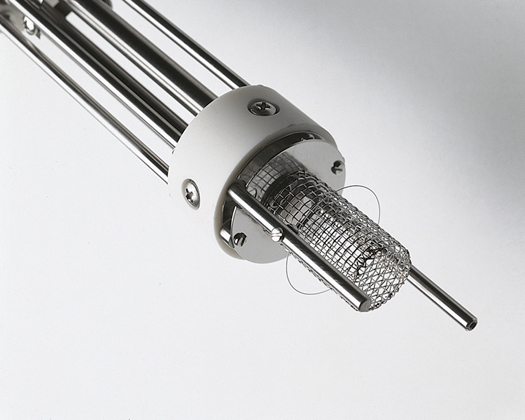 The probe consists of an ionizer, quadrupole mass filter and a detector. The simple design has a small number of parts which minimizes outgassing and reduces the chances of introducing impurities into your vacuum system. 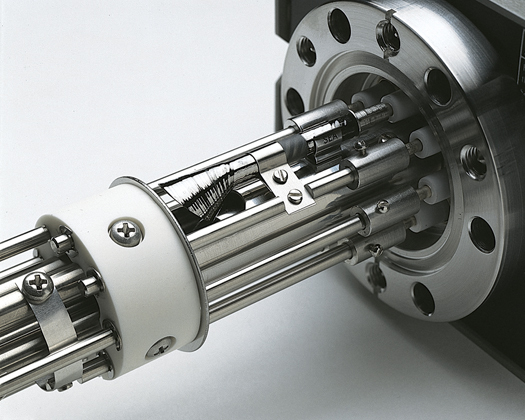 The probe assembly is rugged and mounts onto a standard 2 ¾ inch CF flange. It is covered with a stainless steel tube with the exception of the ionizer which requires just 2 ½ inches of clearance in your vacuum systemabout that of a standard ion gauge. The probe is designed using self-aligning parts so it can easily be reassembled after cleaning. The densely packed ECU contains all the necessary electronics for controlling the RGA head. It is powered by either an external +24 VDC (2.5 A) power supply or an optional, built-in power module which plugs into an AC outlet. LED indicators provide instant feedback on the status of the electron multiplier, filament, electronics system and the probe. 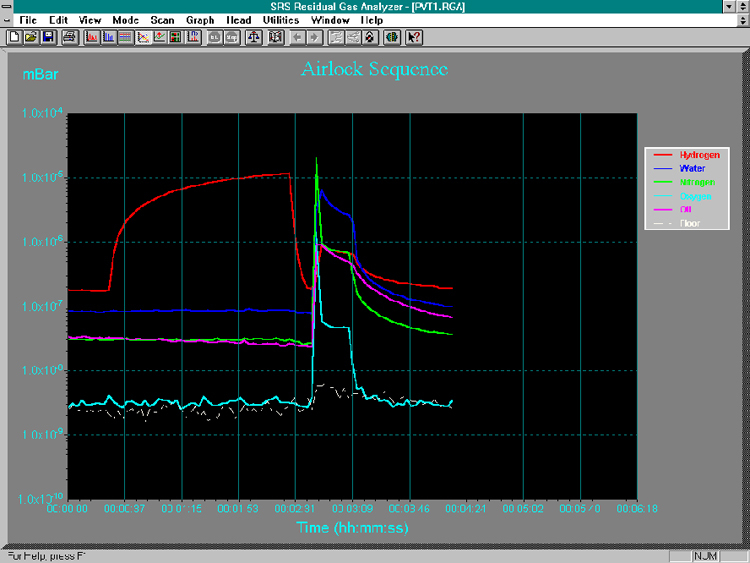 The ECU can easily be removed from the probe for high temperature bakeouts. A long-life, dual thoriated-iridium (ThO2/Ir) filament is used for electron emission. Dual ThO2/Ir filaments last much longer than single filaments, maximizing the time between filament replacement. Unlike other designs, SRS filaments can be replaced by the user in a matter of minutes. A Faraday cup detector is standard with SRS RGA systems which allows partial pressure measurements from 10-5 to 5 × 10-11 Torr. For increased sensitivity and faster scan rates, an optional electron multiplier is offered that detects partial pressures down to 5 × 10-14 Torr. This state-of-the-art macro multi-channel continuous-dynode electron multiplier (CDEM) offers increased longevity and stability and can also be replaced by the usera first for RGAs! The O100HJRW Heater Jacket for SRS’ RGA comes with a Watlow EHG SL10 Process Controller that provides a preprogrammed temperature of 210 °C (± 3 °C). The Heater Jacket is made using PTFE (Teflon) construction, suitable for clean room applications due to its low out-gassing and particle free operation. 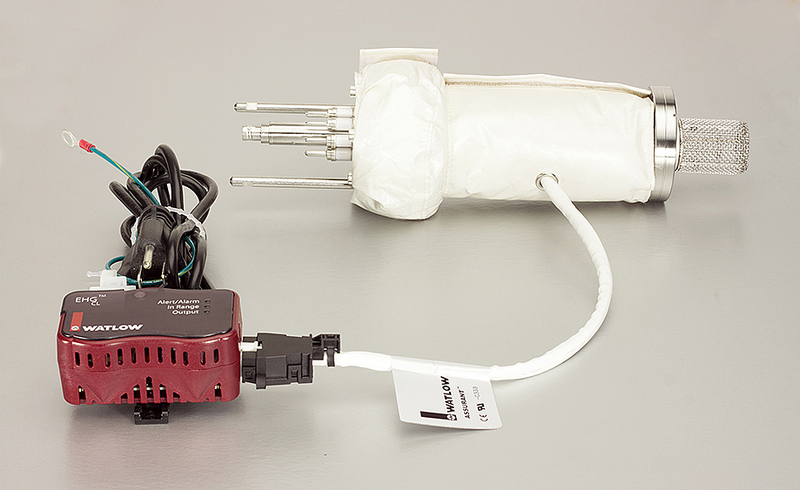 The O100HJRW is offered in 120VAC & 220VAC versions, and is shipped with a country of destination power cord. All RGAs have a built-in degassing feature. Using electron impact desorption, the ion source is thoroughly cleaned, greatly reducing the ionizer's contribution to background noise. A firmware driven filament protection feature constantly monitors (675 Hz) for over pressure. If over pressure is detected, the filament is immediately shut off, preserving its life. A unique temperature-compensated, logarithmic electrometer detects ion current from 10-7 to 10-15 Amps in a single scan with better than 2 % precision. 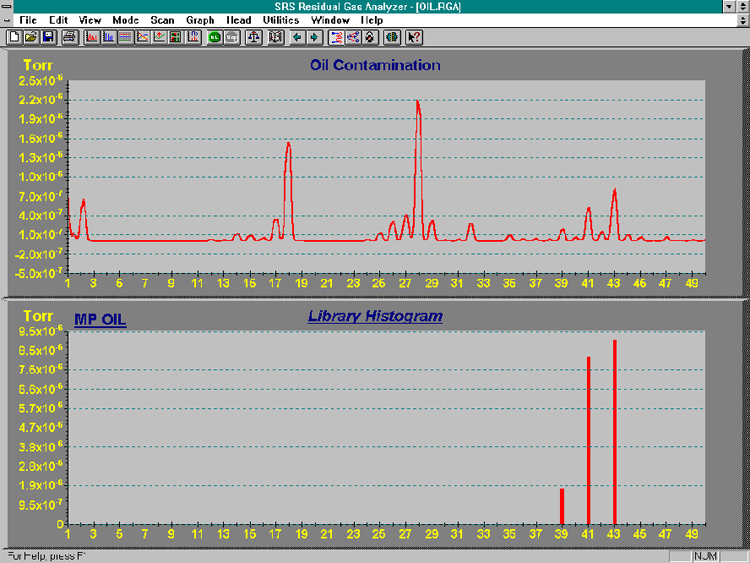 This huge dynamic range means you can make measurements of small and large gas concentrations simultaneously. Communication with computers is made via the RS-232 interface. Analog and histogram (bar) scans, leak detection and probe parameters are all controlled and monitored through a high-level command set. This allows easy integration into existing programs. The RGA systems are supported with a real-time Windows software package that runs on PCs. The intuitive graphical user interface allows measurements to be made quickly and easily. The program is fully interactive, giving the user complete control of the graphical display. Screens can be split for dual-mode operation, scales can be set to linear or log format, and data can be scaled manually or automatically. Data is captured and displayed in real-time or scheduled for acquisition at a given time interval for long-term data logging. Features include user-selectable units (Torr, mbar, Pa and A), programmable audio and visual alarms, and comprehensive on-line help. The software also allows complete RGA head control with easy mass scale tuning, sensitivity calibration, ionizer setup, and electron multiplier gain adjustment. For further analysis, data files can be saved in ASCII format for easy transfer into spreadsheets. Graphic images can be saved as META files or copied to the clipboard for importing directly into other Windows programs. The softwarealso provides password protection for locking out head parameters so that casual users can´t alter important settings. A LabVIEW driver is also available on the SRS website. An optional stand-alone monitor (PPM100) can be used to control the RGA without a host computer. The software supports multiple head operation when more than one RGA is needed. Up to eight ECUs can be monitored from the software. The SRS family of RGAs is ideal for applications involving gas analysis, leak detection, and vacuum processing. We offer 100, 200 and 300 amu systems with supporting Windows software and options that include an electron multiplier and a built-in power module for AC line operation. Resolution Better than 0.5 amu @ 10 % peak height (per AVS std. 2.3). Adjustable to constant peak width throughout the mass range. Sensitivity (A/Torr) 2 × 10-4 (FC), <200 (EM). User adjustable throughout high voltage range. Measured with N2 @ 28 amu with 1 amu full peak width, 10 % height, 70 eV electron energy, 12 eV ion energy, and 1 mA electron emission current. Minimum detectable partial pressure 5 × 10-11 Torr (FC). 5 × 10-14 Torr (EM). Measured with N2 @ 28 amu with 1 amu full peak width, 10 % height, 70 eV electron energy , 12 eV ion energy, and 1 mA electron emission current. Design Open ion source, cylindrical symmetry, electron impact ionization. Filament Thoriated-iridium (dual) with firmware protection. Built-in 1 to 10 W degas ramp-up. Field replaceable. ECU dimensions 9.1" × 4.1" × 3.1" (WHL) Easily separated from the probe for bakeout. LED indicators Power ON/OFF, filament ON/OFF, degas ON/OFF, electron multiplier ON/OFF, RS-232 Busy, Error, Overpressure, Burnt Filament. 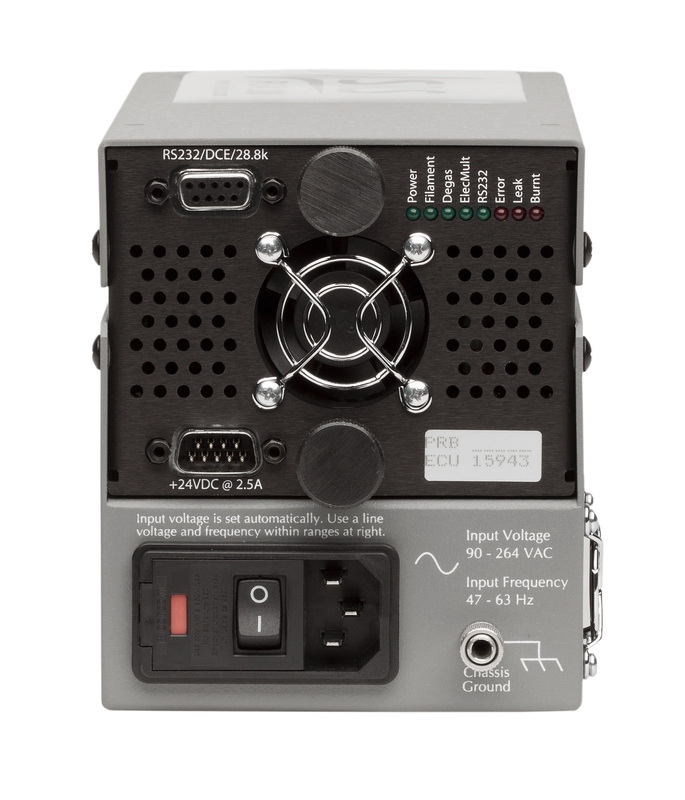 Power requirement 24 VDC @ 2.5 amps. Male DB9 connector. Optional 110/120/220/240 VAC adapter.